A dog can be a child’s best friend and playmate, but bringing a new dog home to a family with children can be worrying. What if the dog snaps? What if the child acts up? Luckily, there are some steps that you can take to help to smooth the transition and make it a safer one. There are many benefits to have dogs in the family when you're raising children. One of the many advantages is the fact that having dogs around will make your babies healthier, and your children are less likely to develop allergies, according to studies. But safety should be considered first when your children are about to be exposed to a dog. 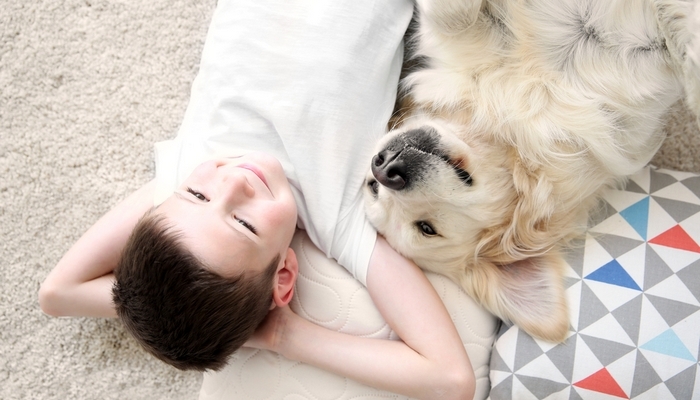 Helping your children understand the responsibilities that come with having a pet should start before you even bring your new furry family member home. Deciding to adopt a dog needs to be a family decision. While you may think that it is up to the adults in the family to make these choices, you need to get your child's opinion on the subject too. Although most kids would be ecstatic to get a pet, that's not always the case. What if your kid doesn't want a dog for some reason? If they've never had experience with a dog, they may be a little nervous about the idea too. You think that bringing a dog into the home is the best way to get them used to pets, but that may not turn out the way you expected. Experts say that dogs can sense when people are nervous around them, even young children. This could cause the dog to feel nervous as well, which is never a could combination and will make a dog less predictable. It would be a much better idea to take your child to visit a friend's dog or to volunteer to help with dogs at a local shelter first. Let your child get used to canines before you decide to bring one into your home. If you let your son or daughter help with the decisions involved in getting a dog, like a breed to choose, they will be more likely to help out with the family pet when it arrives. The below safety tips are for families with older children. Once you've made the decision to adopt a dog, you can begin discussing things with your kids and following these guidelines to make the transition as easy as possible for your family and your new pet. We'll provide more sources to additional advice along the way, so check those out. Explain to your child that as part of the family, they are also responsible for taking care of and keeping your new dog safe. Make it a point to mention that all family members should care for each other, and that your new dog will be a member of the family too. Ultimately, having a pet in your family will teach your child responsibility better than most things in life can. The reason dogs work better than simply sitting down your kids and talking to them is because it works on a subconscious level, and when your children live and communicate with pets, they inadvertently learn many lessons of responsibility. This helps the child to project what a dog might be feeling in certain situations so that they can think about their actions before they carry them out. How do dogs communicate with their people? Talk about how dogs can bark, growl, move away, ask to play, etc. and what each of these things might mean about how your dog is feeling. Teach your child about canine communication and the doggy body language they should be looking for. This is for the safety and security of both, your kids and your pets. Dogs, like people, may love interacting with their family, but they also have boundaries that need to be respected. Give your child an example, wait until they are doing something that they love such as playing a video game, and get very close to them. Ask them if they feel like they need a little more space. Your child will undoubtedly say yes, they would like more space. Use this opportunity to explain that everybody – even your dog – needs personal space, and we need to respect that. At the end of this exercise, apologize to your child for invading their personal space and explain why you did so. RECOMMENDED: Do Your Kids Know How to be Around Dogs? This one might get a little tricky. You need to help your child recognize that dogs don’t always understand things the way that we do. Explain that dogs need us to keep sentences short in order for them to understand us. For example, asking your dog “would you please sit down on the floor” is too much for him to understand at one time. Instead, explain that your child should use a one or two-word request such as “sit” – go through the way dog commands work with canines. Talk with your child about kindness. If someone is unkind to them, how does it make them feel? Now ask your child, if they were to be unkind to your dog, how do they think the dog would feel? Emphasize the importance of being kind. Kids don't always understand how to communicate with pets, especially when dogs don't understand your child's commands. This is why it's better to adopt dog breeds that work well with kids. But ideally, your child will find a way to be more kind and understanding. Sit down with your child and talk about safe and unsafe times to approach or play with the family dog. Use photographs that display certain situations, such as when a dog has a ball and is asking to play and when a dog is eating their dinner. Help your child to identify these safe and unsafe situations and quiz them to test their retention. For example, your dog may have a problem with resource guarding, and if that's the case, it's absolutely vital to warn your kid and also address this problem in the dog. Hop online and print off some infographics, brochures and photographs of dogs expressing certain elements of body language. For example, a dog that has wide eyes in a situation (something referred to as “whaling”) is a dog that is not enjoying what is taking place. This may also be a dog that is likely to bite if pushed too hard. In fact, studies show that aggression in dogs is most commonly expressed in these scenarios. So teaching your child to be able to identify such significant body language signs is the best way to keep the child and your dog safe during any interaction. You'd be surprised how often children expect human responses from canines. Talk to your child about the differences between humans and animals, if that seems necessary. Focus this discussion on how your child is able to communicate their wants and needs with you because you both speak the same language. Explain the way dogs understand humans, and go over the dog command training again, if needed. Talk to your child about how your dog is not able to speak English like them, so they find it much more difficult to “explain” what they might need. Use this conversation to talk about how important it is for your child to watch your dog for what they might be trying to say. You yourself may find this NPR article on communication pretty fascinating. Pull up YouTube and watch videos of dogs and children with your child. Invite your child to discuss if they think the dog in the video is enjoying the activity that is taking place. It can also be useful to show a child a bunch of different tasks that dogs can be taught. 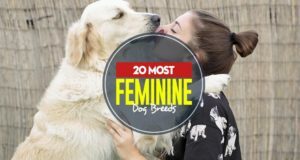 For this type of videos, check out Top Dog Tips YouTube channel where we publish regular videos on how to teach dogs many different commands, tricks and tasks. Just as you would do with a new baby sibling, show your child how to handle and interact with your new dog. Emphasize the importance of being gentle and respectful. This is both for the safety of your kid and your new pet. Here's a good article explaining this concept. If you bring an older dog into the family, it may be more dangerous to allow your kid approach the dog without prior teaching on how to do this. Most dog breeds love children and are generally patience with humans, but they're still animals and can be unpredictable at times, so don't let your kid accidentally agitate the dog. Never, ever leave your child alone with your dog. Even if you are certain that your dog would never bite your child, accidents do happen. A good example of this is a child that loses their balance and falls on a sleeping dog. In this situation, the dog is startled and one of their natural responses to feeling threatened may be to snap or bite. Always be aware of where your child is in relation to your dog. Even if you are busy doing something else, make sure that you know what your child is doing and whether they are involving your dog. This primarily applies to newly adopted dogs. For example, a child left to their own devices with a dog you've recently adopted may try to incorporate the canine in their play by dressing them up in doll clothes, as it's more often seen in cats. This can hurt or irritate the dog and result in growling or even biting. If you see your child putting your dog in an unsafe situation where they may bite or feel uncomfortable, confront your child immediately and take your pet out of the situation. Give your dog an “out” where he can escape and de-escalate while you remind your child about the things you talked about before bringing your dog home. Always take the opportunity to correct your child if they exhibit an unsafe, unfriendly, or unacceptable behavior with your dog. Talk about the situation that took place and ask your child how they could have acted differently. Require your child to apologize for their actions if and when it is safe to do so. Help your child to understand that their dog is not the same as every other dog. Explain this using your child as an example. Is your child like Johnny from their class at school? In some ways they are, but in many other ways, they are different. Apply this concept to your dog. Explain that just because your child likes vanilla ice cream, doesn’t mean that Johnny does and just because your dog likes children playing with them and is kind, doesn’t mean that a strangers dog is.